Just last week, we learned that the next adventure in the long-running James Bond franchise would be titled Spectre, and fans of 007 know why it's a pretty big deal (if you want to know more, check out Alex's piece on the evil organization right here). Well, production on the film from director Sam Mendes officially began today across the pond, and will continue with shooting locations in Mexico City, Rome, Tangier & Erfoud, Morocco, Sölden, Obertilliach and Lake Altausee, Austria. 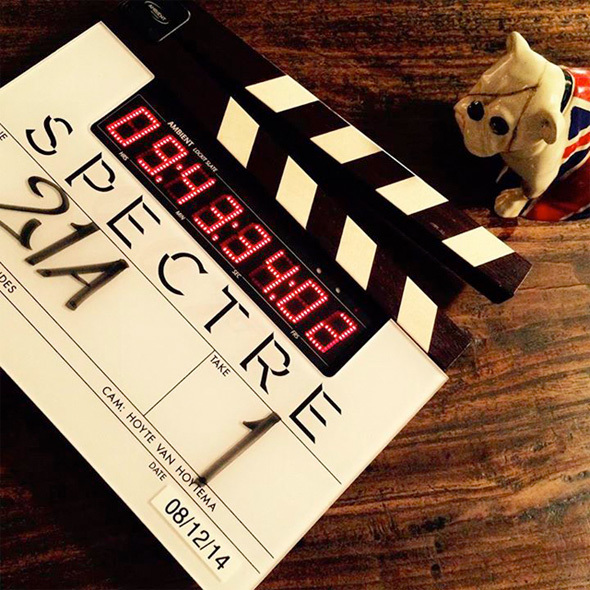 We thought we'd show off the first slate from production on the film bringing Daniel Craig back as 007, mainly because it's a fun tease for the film coming next fall, and it shows that cute little Union Jack porcelain pup. We can't wait to see a real first look! Spectre is directed by Sam Mendes (Skyfall, Revolutionary Road, Road to Perdition, American Beauty) and written by Neal Purvis & Robert Wave with John Logan, all with James Bond franchise experience. A cryptic message from Bond’s past sends him on a trail to uncover a sinister organisation, Spectre. While M battles political forces to keep the secret service alive, Bond peels back the layers of deceit to reveal the terrible truth behind Spectre. Daniel Craig returns as 007 along with Ralph Fiennes as the new M, Naomie Harris as Moneypenny, and Ben Whishaw as Q. New cast members include Christoph Waltz, Monica Bellucci, Dave Bautista and Lea Seydoux. Sony Pictures releases the film next fall on November 6th, 2015. Excited? I hope M doesn't turn out to be a bad guy. I was worried in Skyfall that Finnes was going to be a villain and I don't want that. They made him out to be quite a good guy, but it does seem like he has his secrets. Yeah he does seem that way, probably the reason for little screen time. I'm also speculating it could be as high up as the person who M reported to. Dont quite remember his name. But they had a small part in Skyfall. The grass so green Skies so blue Spectre is really great! Gotta say, I'm disappointed in the title. Bond films have always had the best titles. A sort of elegance to them, if that makes sense. They were always clever in some weird way, I guess. I'm excited as hell to see the return of Spectre, I know it'll be awesome. But the title is just too easy imo. Anyone else?